The Carob tree (from Arabic: kharoub and Hebrew: Charuv), Ceratonia siliqua is an evergreen shrub or tree native to the Mediterranean region, cultivated for its edible seed pods. Also known as St John’s Bread, Carob is not actually a staple, but provides good sustenance during times when other crops are scarce and is a traditional feed for livestock in many areas. In Egypt, it is used as a snack or treat. It is said to have laxative qualities. Moreover, the crushed pods are used to make a refreshing drink with a distinctive taste. Carob syrup, available in Middle Eastern Grocers, makes a great drink base. 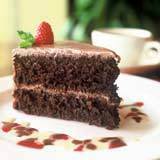 Carob is often eaten fresh, put in cakes, icing, and sometimes cookies. The seeds themselves, also known as locust beans, are used as animal feed. They are also the source of locust bean gum, a thickening agent. Dried carob fruit is traditionally eaten on the Jewish holiday of Tu Bishvat. 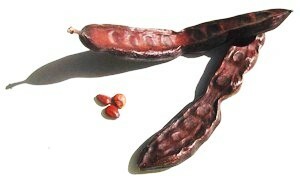 Carob pods were the most important source of sugar before sugarcane and sugar beets became widely available. The flesh of the carob pods are described by some to be ‘chocolatey’ in taste, but contain no theobromine or other psychoactive substances. When mixed with saturated fats like butter fat or palm oil, it is used as a hypoallergenic, drug-free substitute to chocolate, usually referred to simply as ‘carob’. 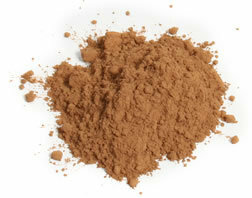 You can buy carob powder from Health Food Stores or well-stocked supermarkets. This two-tiered carob cake is light in texture without the use of any eggs. The cake’s light texture is due to the sour milk. Filled and iced with Carob Vienna Icing, it is an irresistible dessert. Cream the butter, sugar, and vanilla until light and fluffy. Blend the carob powder in the hot water and mix to a smooth paste. Gradually add the carob mixture to the butter and sugar mixture. Add the lemon juice to the milk to sour it. Sift the flour, baking powder, bicarbonate of soda, and salt and add it to the creamed mixture alternately with sour milk. Mix thoroughly. Spoon the cake mixture into two buttered 20 cm (8-inch) cake tins and bake in a moderate oven 180°C/355°F for 30 minutes or until the tops spring back when lightly pressed. Allow the cakes to cool in their tins for 10 minutes. Turn out and allow to cool completely. Fill and ice with Carob Vienna Icing. Blend the carob powder with the hot water. Add the icing sugar to the butter alternately with the carob mixture until it reaches a spreading consistency.